I forgot to show the earrings I made two weeks ago. 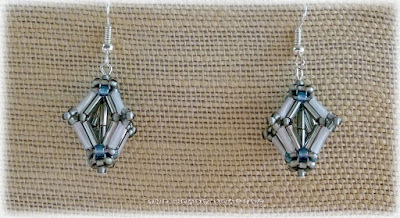 It's called "Diamond Earrings" and it was designed by Julia Gerlach. You'll find the pattern in Beadwork Magazine, February 2016. 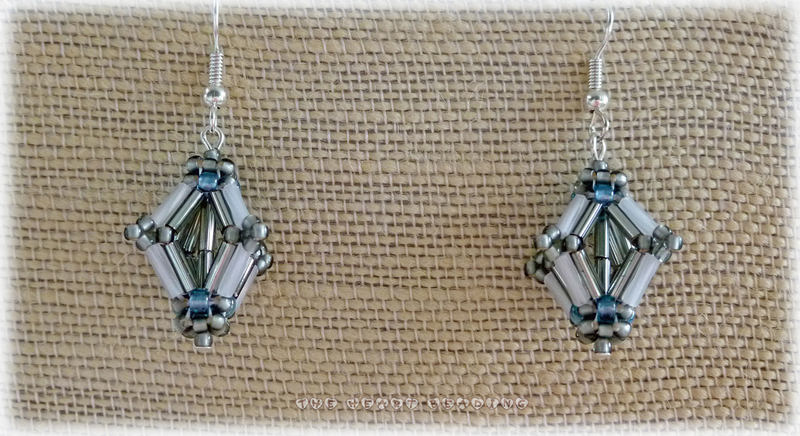 The earrings aren't difficult to make, but I found it tricky at first because I wasn't sure how it would take form. I made a few mistakes: in my first attempt I started making the outside walls in the inside part. And I didn't use a tight tension, so the earring was quite flimsy. But once I got my first earring done correctly, the second one was a breeze. I even made another pair in bronze colors, but I'm waiting for the head pins in copper color that I bought online to finish it. 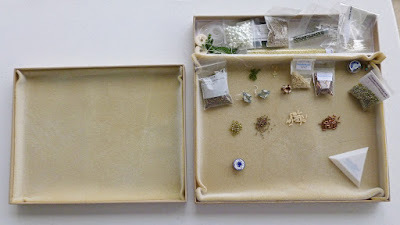 But if you also don't have one of the luxurious bead on it board, you may be happy with this simple idea I had other day: a "beading board box". These are gift boxes that I bought at a local Joann store. They're very sturdy and are available in several sizes. 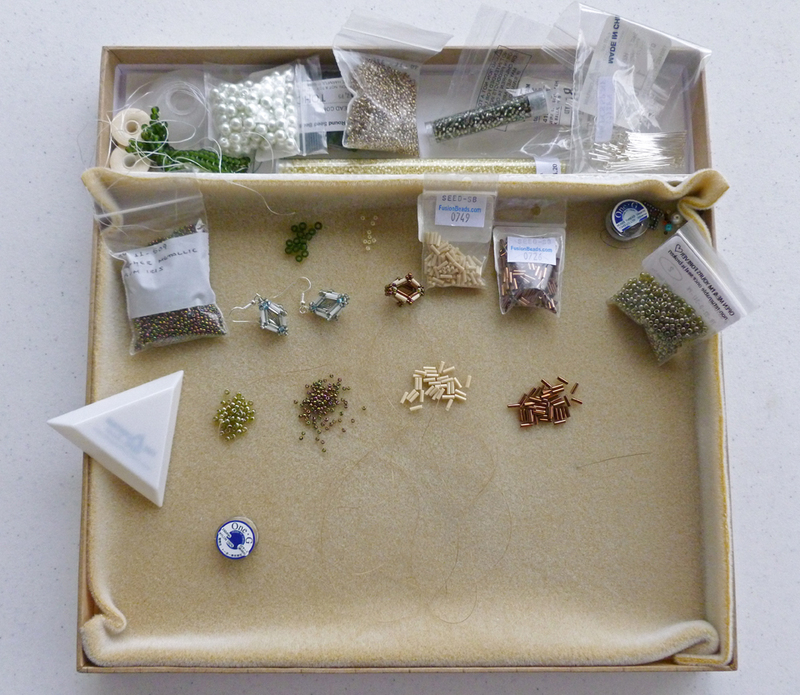 The large boxes measure 1 inch (2.5 cm approx) height. I think it's the perfect height because it's high enough for you to store tubes of beads and other stuff, but it's not so high that makes uncomfortable for you to rest your hands on it. And the best part: it has a lid! I'm emphasizing the lid thing because I always used a piece of fabric to cover my working in progress - to protect it from dust and fur (who has small pets will understand). But now that's not a problem anymore. I can just close the box and leave it anywhere. 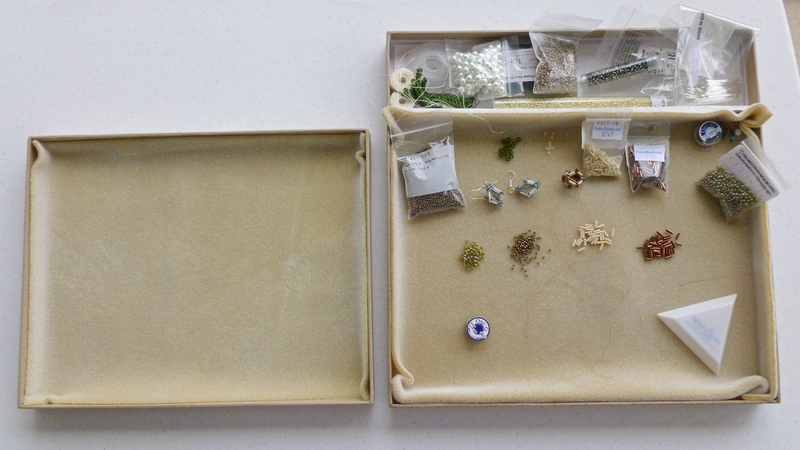 In the small box I just placed a beading mat inside of it - I had to cut the mat because it was too big to fit in. In the large box I created a small section (to keep extra materials) by gluing a piece of cardboard. The large one measures 12.25" and the small measures 8.75" x 11.25". Both have the same height: 1". You can buy the boxes online at Joann website. Click HERE to see the large box and HERE to see the medium one. There are other colors and size options available besides the ones I linked.